Provide the administrator@vsphere.localpassword when prompted. Your new CSR is in the folder you specified titled “vmca_signing_cert.csr” with its corresponding key file. In the Certificate Template Console, under Template Display Name, right-click Subordinate Certificate Authority and click Duplicate Template. In the Template display name field, enter the name of the new template. Click Start > Run, type certsrv.msc, and click OK. Select Base64 Encoded and download the chain. Open .p7b certificate and export both certificates as Base64. Create a chain file called root_signing_chain.cer by running the following command to concatenate the new leaf (vmca) certificate, and the root certificate. Return to the vSphere 6.0 Certificate Manager and select Option 1(Continue to importing Custom certificate(s) and key(s) for VMCA Root Signing certificate). Provide the full path to the root_signing_chain.cer and vmca_signing_cert.key. Once the import is done Login to Platfor Service Controller Web console https://<PSC Serrver>/webssoand check the certificates. I have seen an issue with Out of Office emails are not working for External user, after checking few things I found that auto-reply has been set to false on my exchange, to check auto-reply setting and enable auto-reply please use below commands. If AutoReplyEnabled is false, use below command to enable it. Set-RemoteDomain -Identity Default -AutoReplyEnabled $true. When OOF is enabled, all reply emails are sent using Return-Path:<> (=empty), when your email gateway/smart host detects this they may drop the email so the external sender is not notified that you are out of office. There is no resolution to this on the Exchange 2013 side of things and you must contact your smart host provider to see if they can disable this “feature”. To check if you are running a smart host, in the Exchange 2013 EAC browse to mail flow then select your Send Connector and then edit. you will then see the smart host option. To workaround this issue I have created an automatic reply using a template works without any problem, Please find the below steps to create an automatic reply on outlook. Step 2: Select Automatic Replies and select send automatic relies and then select rules at the bottom. Step 4: Select Add Rule and tick the check box Reply with and click Template. Step 5: Create a template with your out of office message and leave blank in from and to fields. I found this solution working for me with out any further changes on smart host. The first post that urged me to write a new blog because of several hours of head banging against wall, scratching my hair and relentlessly typing on keyboard with random hits as if i caught up on some shockwave. After much of docs reading and agonising go-through ESXi manual, i finally figured out the solution. Step 2: Be very quick and sharp about this step as it needs to be done in matter of seconds. Log in as an administrator to the server that is running vCenter Server. Please follow the KB 2061412 for more info. Today I came across a situation where I am unable to connect to my VDP appliance and come up with below error. there is no problem connecting to VDP configuration. YYYY-MM-DD HH:MM:SS,MS INFO [http-xxxx-exec-x] -impl.X509TrustChainKeySelector: Failed to find trusted path to signing certificate. This issue occurs with the date and time doesn’t match with VDP appliance and vCenter server or ESXi host. Check the ntp settings are configured correctly on your VC and ESXi hosts. 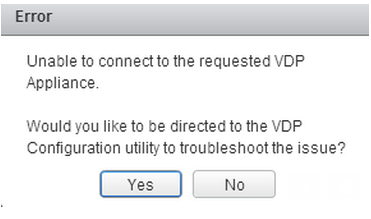 To resolve the issue stop the MCS service on the VDP appliance and start it again .